Spread Your Wings "Wings of Sorrow" was my original piece, but then I decided to make another one similar to it, which turned into the Spread Your Wings wallpaper ^^;; This one is a bit plainer.. oh well. It looks alright still. I also entered this wallpaper into Paradise's contest, and guess what? IT WON 2ND PLACE!! Whooot =) *dances* hehe, pretty good huh? There are also very light words in the background. I made up the phrase :D It took me a while, since I wanted it to make sense (unlike my other wallpapers =P). I dont even know if it makes sense. I just kinda kept on typing and typing. Well, enjoy! I love all of this! The butterfly shaped wings, the lightly coloured words and the entire background. This is just awesome! For some reason it doesn't look like it has anything to do with sorrow. I could be wrong since it's like 2 am in the morning and I really need sleep! But overall excellent job and this totally deserves to be one of the top 3 in that contest you entered, minus the fact that I have no idea what the other pics may have looked like. Keep it up! 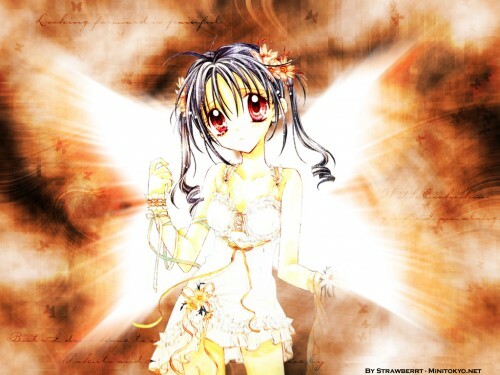 Nice bg ^_^ But somehow it looks too soft >_< I love the wing you create for Mitsuki ^_^ Nice try! Keep it up! I love this wallis sooo soooo much! I think it's my favorite thus far! woow! everything matches it amzing!! though i dont like the scan not cz of u i just dont like it...well great work! meh....ish still lovely! But the glow is too bright makes the character looks kinda blurred...but I really love those wings....cool! This wallie is so beauty! The colours and the background are fantastic!